In Iowa’s climate, the general consensus of independent building science experts is that Radiant Barriers (usually a thin aluminum sheet, sometimes perforated to allow for vapor movement) are a poor investment at best. At worst, depending on the product and how it is installed, radiant barriers have the potential to create moisture and ventilation problems within the roof system. A building is a system. Changes made to one part of that system affect the operation and efficacy of other components. Particularly when it comes to managing heat, air movement and moisture, it is critically important to understand and anticipate how the system will react to changes. Building methods, materials, and construction details work differently in different climates – strategies that may be effective in Arizona’s hot dry weather may perform poorly (or even have negative impacts) in a place with cool moist weather. Heat transfers by three primary methods: conduction, convection, and radiation. Conduction – Heat transfers from a warmer location to a cooler location within a material or assembly, such as a coffee cup transferring heat from the coffee to your hands as you hold it. Convection – As a liquid or gas warms, it becomes less dense and rises. When it cools, it becomes more dense and it sinks. Convection refers to the transfer of heat through movement of a liquid or gas through these currents. Radiation – Radiant heat travels in a straight line away from a warm surface, transferring heat to mass that absorbs its energy, such as the sun warming an asphalt parking lot or the roof of your house. A radiant barrier is a thin reflective material designed to reflect radiant heat (the heat that radiates from the underside of a hot roof into an attic space, for example). A radiant barrier has no measurable “R-value”, or resistance to conduction of heat, itself. 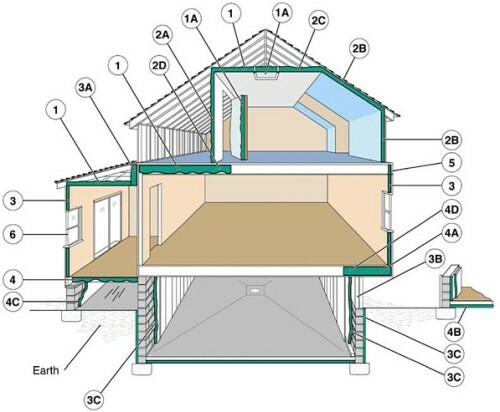 In order to effectively reduce cooling load in a hot climate, a radiant barrier is typically installed across the underside of the roof rafters or top chord of the roof truss. Radiant barriers installed on an attic “floor” on top of an insulated ceiling are not effective for their intended use. They will tend to collect dust, which renders the reflective capacity null. In climates with substantial heating loads (cool climates) it is almost always more cost effective and energy-efficient to install more attic insulation than to install a reflective radiant barrier. The actual energy savings resulting from installation of a radiant barrier in a Zone 5 climate such as Iowa result in an extraordinarily long payback. Energy savings during the summer cooling season are offset by inefficiencies in the winter heating season, where a sun-warmed roof reduces heating load. A much better investment would be to increase attic insulation, air seal where appropriate, and ensure proper ventilation. An Oak Ridge National Laboratory study discusses potential energy savings from increased insulation and radiant barrier installation. Table 2 in the study highlights the ineffectiveness of radiant barriers in Iowa’s climate (Zone 5). In a Zone 5 attic where there is no ductwork, upgrading attic insulation from R-19 to a code-compliant level (currently R38) results in an estimated energy savings of $105/year. Addition of a radiant barrier results in an estimated savings of around $5/year. Additionally, radiant barrier systems are more expensive than standard insulation. In conclusion: If you live in Iowa, don’t install a radiant barrier. Focus your investment on things that have an actual benefit and shorter payback. Like LED lights and insulation! If you have questions or an unconventional building with special conditions, contact a building professional who is not trying to sell a radiant barrier.